This is a fantastic Package Deal. 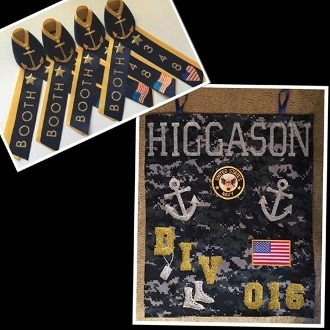 You get 4 double colored ribbons in our most popular Navy and Yellow/Gold or for our 800/Special Op's divisions Black and Yellow/Gold colors with your Sailor's name on the left, DIV on the right, and your choice of silver or gold accents for the anchor, stars and letters. You also get a door banner with your Sailor's name, DIV, choice of one anchor or two and choice of fabric and accent colors. Best of all The Package Deal saves you money.